The UK government has added its voice to demands from sponsors for Fifa president Sepp Blatter to resign with immediate effect. Swiss criminal proceedings were opened against the 79-year-old last week. Sports Minister Tracey Crouch said: "The sooner Blatter goes, the sooner wide-scale reform at Fifa can begin." Major Fifa sponsors Coca-Cola, Visa, Budweiser and McDonald's on Friday called for him to quit, but Blatter said he would not step down until 2016. Coca-Cola said "every day that passes Fifa's image and reputation continues to tarnish", while McDonald's claimed it would be "in the best interest of the game" for Blatter to stand down. Blatter is accused by Swiss prosecutors of signing a contract that was "unfavourable to Fifa" and making a "disloyal payment" to Uefa president Michel Platini, but denies any wrongdoing. In a statement released through his lawyers on Friday, Blatter said resigning now "would not be in the best interest of Fifa, nor would it advance the process of reform". Football Association chairman Greg Dyke described Friday's developments as a "game-changer". 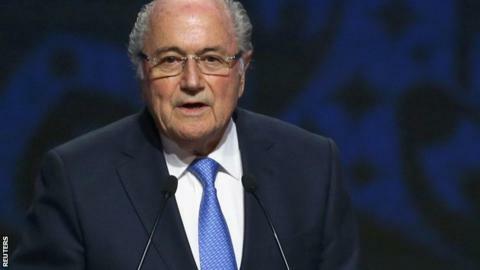 Blatter then announced he would step down as president in February 2016. "The dramatic and co-ordinated intervention of these powerful US sponsors - including one of Fifa's oldest partners, Coca-Cola - heaps yet more pressure on Sepp Blatter and adds to the sense of chaos that now surrounds world football's governing body. "However, some will ask whether or not these corporations are prepared to back up their words with actions. Will they actually withdraw their sponsorship if Blatter continues to defy them? With the threat of rival companies taking their place, many suspect they will not. It is also highly unlikely that Fifa's other non-US sponsors - Hyundai/Kia, Gazprom and Adidas - will join the demands for him to quit immediately. "There is no easy solution here for Fifa. If Blatter was finally forced out, next in line to take over is Fifa senior vice-president Issa Hayatou, a man who in 2011 was reprimanded by the IOC over alleged bribes. The calls for a fully independent, external reform commission get louder every day." He has said the 2011 £1.5m payment made to Platini, the head of European football's governing body, was "valid compensation and nothing more". Platini, 60, has said he received the payment for work as Blatter's technical advisor between 1999 and 2002 and has written a letter to Uefa members denying any wrongdoing. The contract described by Swiss prosecutors as "unfavourable to Fifa" is thought to refer to a 2005 TV rights deal between Fifa and Jack Warner, the former president of Concacaf, the governing body of football in North and Central America and the Caribbean. According to an investigation by Swiss broadcaster SRF in September, the deal allegedly resulted in a multi-million pound profit for Warner's company. Meanwhile, a separate Swiss investigation is looking into the bidding process for the 2018 and 2022 World Cups, which will be held in Russia and Qatar respectively. Who are Fifa's partners and sponsors? What's behind Sepp Blatter's questioning?